Can you think of the ultimate football tour - a lads tour to Barcelona, participating in a 5-a-side football tournament, taking glory, celebrating in one of Europe's best nightlife centre's and to top it all a free visit to world football's most iconic football stadium. 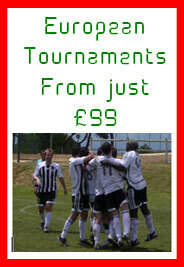 Well that's what we're offering at the 2011 Barca Fives on the 5th November, 2011. Book our qualifying hotel package and we will throw in a free visit to the Nou Camp for every member of your team. This offer is available for all bookings made before 18th August, 2011. Athletico Do Hollande were bidding to become only the second team in history to win three eurofootballfives tournaments when they met Inter Women in the 2011 Amsterdam Fives final. Inter Women had other ideas and claimed their maiden title with a superb 4-1 victory. It was disappointment for Athletico Do Hollande who hoped to add an Amsterdam trophy to two Algarve successes. Inter Women were superb though and with the tournament top goalscorer (Daniel Powell, 16 goals) plus plenty of goals from elsewhere they thoroughly deserved their victory. In the Plate competition Rigford Seahawks won their 3rd title as they added the 2011 Amsterdam Fives Plate to the 2009 Krakow Trophy Cup and 2009 Prague Trophy Plate. They defeated Ireland's Deportivo Dooradoyle 1-0 in a tight final. Follow this link for the full tournament report. The 2011 Algarve Open was one of our greatest tournaments to date and saw Athletico Do Hollande create a little bit of history when they became the first team in 33 tournaments to retain a eurofootballfives.com title. A number of teams had come close with 3 teams making the final the year after they'd won a title but all had lost. Athletico Do Hollande broke the mould to add the 2011 Algarve Open title to their 2010 triumph. They were made to work very hard though as Cheesecake FC pushed them all the way but the Dutch had just enough to win 3-2. There was double success for Athletico as their striker Toufik Haddouchi claimed the top goalscorer award with 9 goals in the tournament. In the Plate competition there was success for Eagles UnAthletic who had also won the 2010 Krakow Trophy Plate (under the name Eagles Old Boys). In the Wooden Spoon it was a debut win for Misfits FC. The debut Mallorca Tournament proved a hit in 2011 with teams from Ecuador, England and Spain competing for glory on the beautiful Balearic Island. With 12 teams coming to do battle we had two groups of six with some of the most competitive group football we've had in 31 tournaments to date. There was some great football and intriguing results along the way. In the end the overall prize was won by Policia Local de Palma who had too much in the tank for an entertaining Quayaquil 100% side with their flamboyant South American style. In the Plate competition it was FC Dukesfield who emerged victorious via Golden Goal against Inter Urmum. The Top Goalscorer prize was claimed by Piero Zapata of Quayaquil 100% with 10 goals in 7 games. The tournament was played in a cracking atmosphere on a glorious day - thank you to everyone who helped make it such a triumphant debut in Mallorca for eurofootballfives.com. We'll see you again in 2012! Olympic Phil Babb see off 20 competitors from 5 nations for historic tournament victory. Olympic Phil Babb arguably came through their toughest test yetas they defeated 3 Hungarian, 2 English, 1 French and 1 Swedish team on the way to collecting their 4th title in 4 tournaments. There was local success as Hungarian team Al-Kaloida won the Plate competition and Whiteley VII took the Wooden Spoon award. Marci Markovits took the personal honours with 8 goals to finish as the day's top goalscorer. On a glorious day it was a strong day for the Spanish teams with all four semi-finalists despite the presence of 2009 Barca Fives winners Luminy Wolves of France. They crashed out on penalties in the Cup Quarter-Finals having looked red hot favourites for the surprise of the tournament. It was Equipo A who added a Cup trophy to the 2009 Barca Fives Plate. Rapid Bosco Navas narrowly missed out on a second Barcelona trophy after success in the 2008 Barca Fives. In the Plate there was success for Bristol Bridge and Stamford AC picked up the Wooden Spoon. In terms of personal awards, Marc Cheucos claimed the top goalscorer prize with a great tally of 14 goals. Click here to see how the action unfolded. If any of you have flown to Barcelona using Girona or Reus airports then you will be aware of the flight savings you can make by going to an airport out of town instead of the most central airport. A little known secret is that you can reach Krakow by flying into Katowice airport and make similar savings. We are offering a £15 discount off packages to the Krakow Trophy flying into Katowice airport using WizzAir from Luton or Doncaster Sheffield airports. Currently, flights from these airports are available from just £97 per person (although this could change at any time). Ryanair also have flights to Katowice from London Stansted, Birmingham and Dublin airports starting at £85 per person (from Birmingham). Please ask us for more information and details. Visit the 2011 Krakow Trophy tournament page here.